Israeli police landed the most damaging blow yet on Prime Minister Benjamin Netanyahu Sunday, after two years of investigations, recommending he and his wife be charged in a third corruption case. Why it matters: These allegations are by far the most serious Netanyahu faces, writes Axios contributor Barak Ravid. 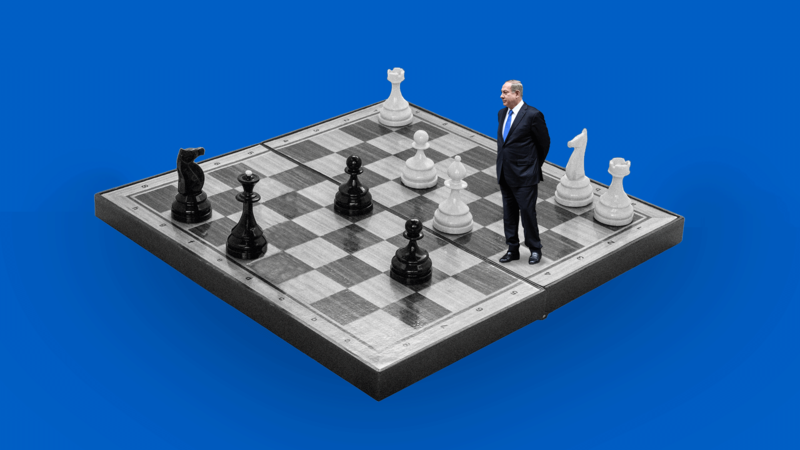 The man who has dominated Israeli politics for a decade is now waging a battle for political survival. When will the attorney general make his decision on indicting Netanyahu? It will be close to impossible for him to close down all three cases. When will Netanyahu call for early elections? He wants to keep fighting the legal battle, and to do so from the prime minister's office after being strengthened by another election victory. Catch up quick: The most painful hit yet for Netanyahu and his wife Sara stems from "Case 4000," concerning their relationship with Israel's leading telecommunications tycoon. According to Sunday's police statement, Netanyahu, who at the time was also the telecom minister, allegedly gave Shaul Elovitz regulatory benefits worth hundreds of millions of dollars. In return, Netanyahu and his wife were allegedly allowed to demand positive coverage from one of Israel's major news websites, owned by Elovitz. Flashback: Police recommended charges in two other bribery cases in February. One involves Netanyahu allegedly taking "gifts" worth $200,000 from businessmen in return for promoting their interests (Case 1000). The other is an alleged bribe deal between Netanyahu and Arnon Mozes, the publisher of Israel's largest newspaper (Case 2000). While Trump has Mueller, Netanyahu's nemesis over the last two years was Israeli chief of police Roni Alsheikh. Alsheikh is a former deputy director of the Shin Bet security agency and was picked for the top police job by Netanyahu who, according to his associates, believed Alsheikh would be easier to control. In fact, Alsheikh aggressively pursued the allegations against Netanyahu. Like Trump, Netanyahu has accused the police and media of carrying out a “witch hunt” against him. He has aggressively attacked the press and denounced leaks and came up with a slogan to rouse supporters at political rallies and on Twitter: "There will be nothing because there is nothing." Trump has used similar language. Like Trump, Netanyahu is counting on his attorney general. He appointed Avichai Mandelblit, a former member of his Cabinet, to the post in 2016. Mandelblit's critics claim he’s going soft on Netanyahu and dragging his feet on the corruption cases. What's next: There had been speculation Netanyahu would try to cut a deal with the attorney general: resignation from the prime minister's job in return for the closing of his three legal cases. But a speech last night in which Netanyahu harshly attacked the police indicates he's not going down that road. President Trump's trade truce with China looked set to last a bit longer than expected after Larry Kudlow said today that the 90-day period the sides agreed on at the G20 wouldn't begin until Jan 1. Turns out it was just more confusion. The White House has now suggested Kudlow misspoke, and the countdown began on Dec. 1. Behind the scenes from Axios’ Jonathan Swan: Administration officials and China hawks close to the White House were stunned by Kudlow’s comments this morning, which threw the timeline the Trump team had announced into confusion. It took them until shortly before 6 pm ET to correct the record. "At first glance the outcome looks like a win for Xi Jinping and China. The Chinese are always playing for time and any pause that involves more talking is a victory for Beijing, as it only adds to the chances they have for a shift to a more favorable US domestic political environment and, as we have learned with the waning 'maximum pressure' campaign on North Korea, once you step back from the brink it is difficult to marshal the support to return to it if the talks do not bear fruit." The markets like the deal. China hawks do not. Swan has been speaking to some who are worried he's too concerned about the stock market tanking to keep ratcheting up the pressure with new tariffs. "Everything has got to be seen through the prism of the [Mueller] investigation and needing short-term micro tactical wins. And that's why the stock market going up is a win." What to watch: The U.S. wants concessions from China on forced technology transfers, IP theft, certain trade practices and cyber theft. So far, the sides can't seem to agree on what they've already agreed on. The bottom line: "Maybe we really have walked back from the brink, but I doubt it and am still very skeptical that the U.S. and China can solve the underlying structural issues in the next several years, let alone 90 days," Bishop writes. 3. Europe: Macron faces "worst riots since '68"
French President Emmanuel Macron has visited the graffiti-stained Arc de Triomphe, called for urgent talks and postponed a trip to Serbia after what are being called the worst riots to hit Paris since 1968. Paris' mayor says up to $4.5 million in damage was done on Saturday alone. An elderly woman in Marseille was killed after being hit by a tear gas canister at her window. What is going on here? Sophie Pedder, the Economist's Paris bureau chief and author of a new book on Macron (which I recently read and enjoyed), explains that while "Macron has faced down waves of strikes and street protests since his election 18 months ago ... this one is very different." "The gilet jaunes (yellow vests) movement began as a protest by those who drive long distances to work against higher green taxes on diesel. But it has since captured a far broader anger against Macron." "Protestors represent France’s squeezed middle: incomes are too high for full welfare benefits, but too low to make ends meet. They are angry at Macron’s early tax cuts for the better-off, and a perception that he is indifferent to ordinary people’s concerns." "Most gilets jaunes, manning blockades on roundabouts across provincial France, are peaceful. Over the past three weekends, the numbers have dropped: from 280,000 countrywide to 136,000 on Saturday. But as the figures have fallen, the violence has intensified." What to watch: "This is the first real political crisis of Macron’s presidency. The power vested by the constitution in the French presidency makes him both the focus of inflated hopes, and of all anger. During his election campaign Macron was himself the leader of a (peaceful) political insurrection. ... Now the rebellion is against him. ... How he handles it will probably determine his presidency." Andrés Manuel López Obrador began the week, his first as president of Mexico, with a 7 am press conference. Since taking office on Saturday, he has already turned over the presidential palace to the public and sold off the presidential plane (he flew coach yesterday). On immigration, the biggest point of tension in the U.S.-Mexico relationship, he signed a development plan on inauguration day to address the root causes of migration from Central America. He also dispatched his foreign secretary to meet with Secretary of State Mike Pompeo, who is hoping to cement a deal that would see asylum-seekers remain on the Mexican side of the border while their applications are processed. Daniel Erikson of the Penn Biden Center writes for Axios Expert Voices that López Obrador's convincing mandate and majorities in both houses will "grant him ample leeway to pursue his agenda." "AMLO ran on an anti-corruption platform and has promised a 'fourth transformation' of Mexico through ambitious reforms, infrastructure projects and a raise in the minimum wage." "He has vowed to consult frequently with the public via referendums and to shake up government by trimming top positions, reducing salaries and benefits (including pensions for former presidents) and keeping a watchful eye on the public purse." 1. The Ebola outbreak in the Democratic Republic of the Congo is now the second-largest in history. Security concerns are hampering the response. Meanwhile, we're three weeks out from what will be a tense presidential election in the DRC. An opposition candidate today claimed voting machines will be rigged, and a chaotic election could be used as an excuse for President Joseph Kabila to cling to power. 2. Nigerian President Muhammadu Buhari has denied that he is dead (you read that right) following speculation he was replaced by a body double, or even a clone. Despite health struggles, he's seeking re-election next February in Africa's most populous country. 3. Only a handful of African countries currently have the mobile connectivity, research hubs, government support and global partnerships necessary to benefit from the global artificial intelligence boom, Aleksandra Gadzala, an Atlantic Council fellow and CEO of Magpie Advisory, writes for Axios Expert Voices. George H.W. Bush has returned to Washington for the last time as part of a four-day tribute here and in Texas. Because so much of Bush's legacy is tied to foreign policy, I thought this would be a fitting flashback. "For 40 years, the Western alliance has stood together in the cause of freedom. And now, with reform underway in the Soviet Union, we stand at the threshold of a brand new era of U.S.-Soviet relations. And it is within our grasp to contribute, each in our own way, to overcoming the division of Europe and ending the military confrontation there." "As I leave Malta for Brussels and a meeting with our NATO allies, I am optimistic that as the West works patiently together and increasingly cooperates with the Soviet Union, we can realize a lasting piece and transform the East-West relationship to one of enduring cooperation. "That is a future that is worthy of our peoples, and that's the future that I want to help in creating and the future that Chairman Gorbachev and I began right here in Malta." It's worth considering how that crucial period in history might have played out were a different U.S. president in office. “It’s a killing activity. But at my age, I am not really bothered because I take marijuana to stay awake." — Rodrigo Duterte, in an apparent joke, after complaining about how taxing foreign trips are. His drug war in the Philippines has killed thousands. Thanks for stopping by — see you Thursday evening!